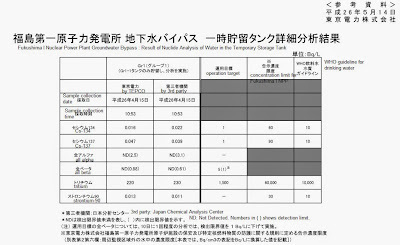 TEPCO released the nuclide analysis of seawater before and after the release of groundwater from "the groundwater bypass" scheme on May 23, 2014. No significant change was observed. 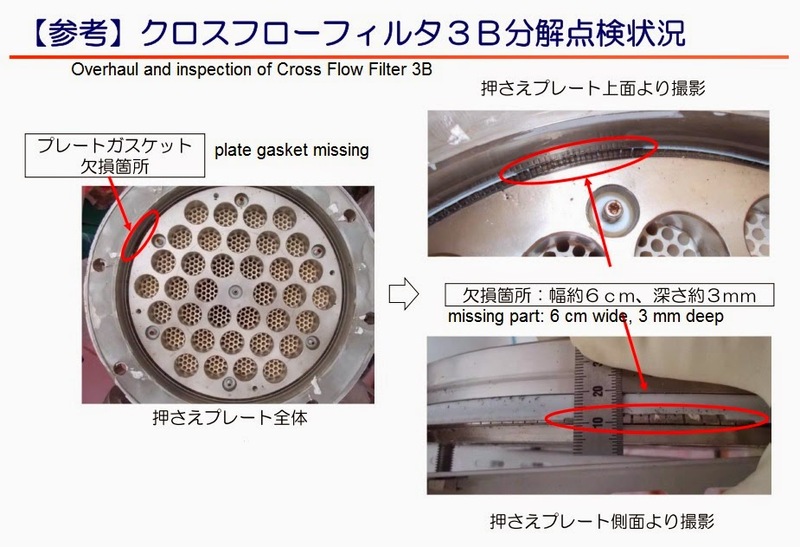 According to TEPCO, the seawater sample was taken about 220 meter south of the groundwater bypass drainage outlet and analyzed. 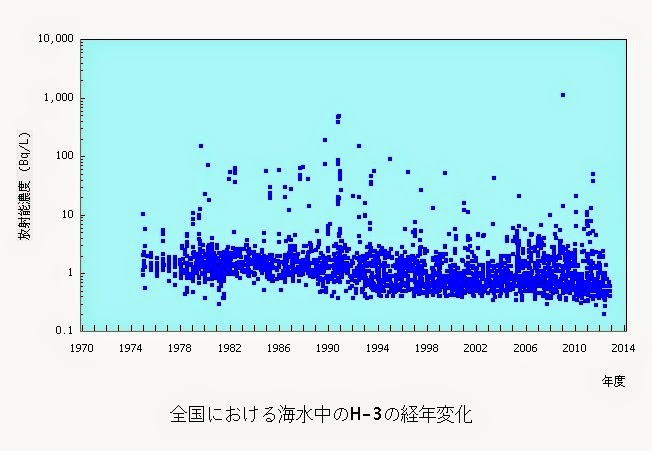 Cesium-134 and cesium-137 were below detection levels before and after the release of the groundwater. All-beta was 12 Bq/L before the release, and 11 Bq/L after the release. Tritium was 3.9 Bq/L before the release, and 2.2 Bq/L after the release. Tritium in single-digit becquerels per liter of seawater. How does this compare to what existed before the Fukushima nuclear accident? 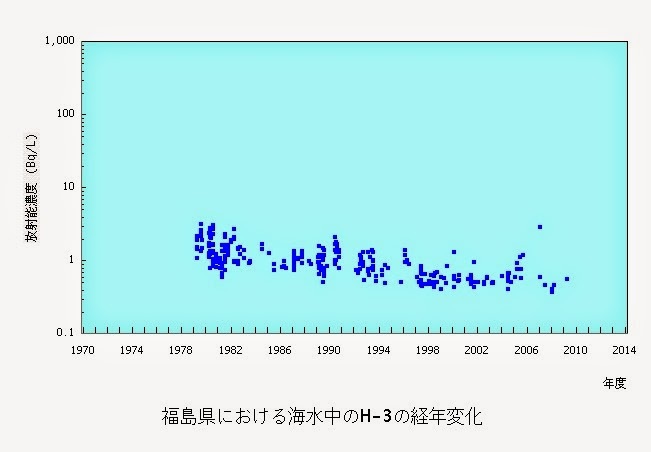 From the database maintained by Japan Chemical Analysis Center (radiation monitoring around nuclear facilities in Japan), the historical range for Fukushima Prefecture from 1979 to 2010 (two nuclear power plants - Fukushima I and Fukushima II) is approximately 0.4 Bq/L to 4 Bq/L. How does Fukushima compare to other prefectures with nuclear power plant? Here's a chart plotting tritium levels in Fukushima (two plants with 8 boiling water reactors), Ibaraki (2 plants, one decomissioned, one boiling water reactor from 1978 on), and Hokkaido (one plant with 3 pressurized water reactors, from 1989 on). Now Fukushima is in red triangles (which I have no control over in the chart creation app at the website), Hokkaido in blue squares, and Ibaraki in black crosses. The range is approximately 0.4 Bq/L to 200 Bq/L (Ibaraki). 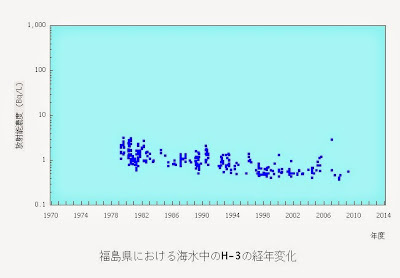 Hokkaido's spike above 10 Bq/L in 2011 may be the effect from the Fukushima nuclear accident, but the sample was collected in August 2011, nearly five months after the start of the accident and four months after the leak of extremely contaminated water from Reactor 2. Now let's add "Nuclear Ginza" - Fukui Prefecture, with 13 reactors (most of which are pressurized water reactors). The range is approximately 0.4 Bq/L to 1100 Bq/L (Fukui). 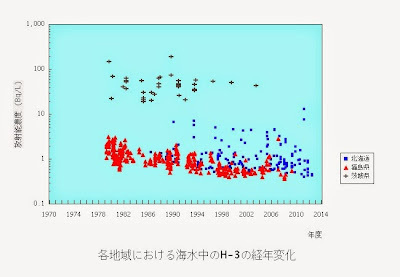 1100 Bq/L of tritium was measured from the sample taken off Tateishi on April 24, 2009, according to the Japan Chemical Analysis Center database. Tsuruga Nuclear Power Plant is located nearby. I couldn't find any incident on or around that date for the plant. (UPDATE) TEPCO Nuclear's tweet from 30 minutes ago says they finished the release at 12:42PM. 561 tonnes in total. Again, the groundwater is NOT highly radioactive, as it is drawn before it enters the reactor buildings. Having secured the consent from the Fukushima fishermen with the help from the national government (Ministry of Economy, Trade and Industry, which is still in charge of oversight), TEPCO has started releasing the groundwater drawn from the wells before the water reaches the reactor buildings and gets contaminated heavily. Release of the groundwater started at 10:25AM on May 21, 2014. The groundwater had been drawn from the groundwater bypass wells and stored in the temporary storage tank. About 560 tonnes of water will be released today. The area patrol was done at 10:30AM, and we confirmed there was no leak or other abnormalities [along the pipes]. NHK says the release is from the South Drainage Outlet, which is located south of the plant harbor. That means the water is directly going into the ocean. 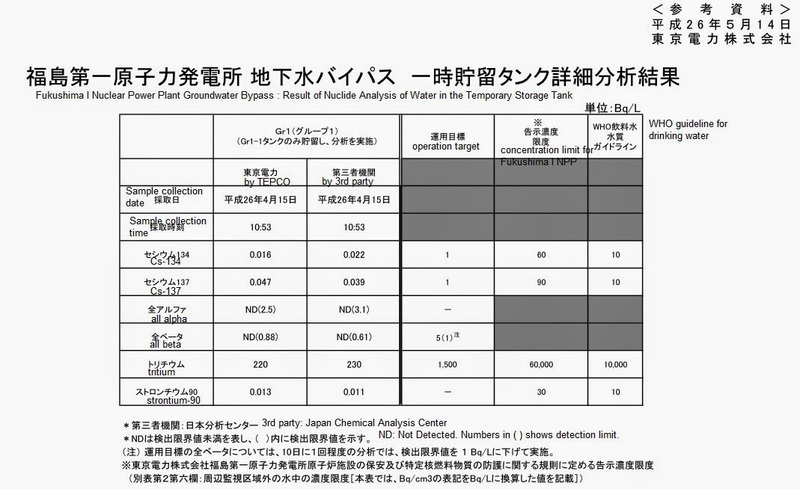 As to the contamination levels of the water (which was drawn in April), TEPCO released the nuclide analysis done by both TEPCO and a third-party laboratory (Japan Chemical Analysis Center), as per agreement with the fishermen in Fukushima. Tritium, measured by Japan Chemical Analysis Center, is 230 Bq/L. The rest of radionuclides, including alpha nuclides, are in negligible amounts or ND. The wells in dark blue circles, pipes to transport the water to the ocean in yellow. 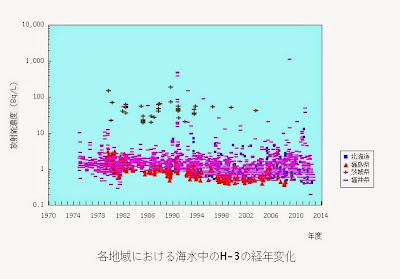 The red circle above marks the H4 tank area where highly contaminated (beta nuclides) wastewater (after reverse osmosis treatment) was found leaked in August 2013. You can also see the South Drainage Outlet in the upper right corner. Did Kitty Litter Cause Chemical Reaction That Led to Radiation Leak at WIPP in New Mexico? The story was on May 13, 2014 on Reuters, before the latest update from the US Department of Energy on May 16, 2014. It fondly reminded me of TEPCO's use of bath salt (as tracer) and shredded newspaper and baby diaper polymer to plug the leak at the water intake for Reactor 2 back in April 2011. Kitty litter used to absorb liquid in radioactive debris may have triggered a chemical reaction that caused a radiation leak at a below-ground U.S. nuclear waste storage site in New Mexico, a state environmental official said on Tuesday. The waste disposal site, where drums of plutonium-tainted refuse from nuclear weapons factories and laboratories are buried in salt caverns 2,100 feet (640 meters) underground, has been shut down since unsafe radiation levels were first detected there on Feb. 14. The leak of radiation, a small amount of which escaped to the surface and exposed 21 workers at the Waste Isolation Pilot Plant, ranks as the worst accident at the facility and one of the few blemishes on its safety record since it opened in 1999. Investigations of the chamber where the leak occurred suggest a chemical reaction may have generated sufficient heat to melt seals on drums and boxes of contaminated sludge from the Los Alamos Nuclear Laboratory, releasing radioisotopes such as plutonium, Energy Department officials have said. Jim Blankenhorn, deputy manager with the contractor running WIPP, told a public meeting last week that a change in the materials used at Los Alamos to package waste may have triggered a reaction between nitrate salts and organic matter. “Kitty litter is in the field of theories,” Jill Turner, spokeswoman for the New Mexico Environment Department, said about a possible cause for the accident. Kitty litter is used as an absorbent for liquid contained in radiological debris destined for WIPP, which does not accept fluid waste, Turner said. Los Alamos, a leading U.S. nuclear weapons lab, and the WIPP contractor, Nuclear Waste Partnership, did not immediately respond to requests for comment on Tuesday. Dozens of drums of waste from Los Alamos that have been linked to the radiation accident are deposited in two separate waste disposal chambers at WIPP, managers have said. The plant last week suspended shipments of that waste to a Texas-based commercial storage facility, which had received 25 drums between April 1 and May 1, said WIPP spokesman Brad Bugger. The plant in the Chihuahuan Desert in southeastern New Mexico provides for permanent disposal of contaminated items like clothing and equipment from U.S. nuclear laboratories and weapons sites. It is not expected to resume operations for at least 18 months and may take as long as three years to be fully operational, managers have said. The entire ALPS multi-nuclide removal system is down again, as Line C has just been stopped as the water sample from Line C is found with high calcium content. Line A was stopped three days ago, and Line B has been idle since March this year, when the water treated in Line B was found with high beta (in the order of 10 million Bq/L) and brand-new storage tanks got contaminated. Stopping ALPS won't affect the cooling of reactors, as the treatment for the cooling water is done by SARRY (removal of radioactive cesium) and by the reverse osmosis apparatus (desalination). Line C of the multi-nuclide removal system ALPS has been in operation. However, we noted in today (May 20, 2014)'s scheduled sampling that the water [coming out of] Line C was clouded, and that it had high calcium content. As the result, all three lines of ALPS have stopped treatment operation. We will investigate the cause. Whether the defective gasket is due to material defect, design defect or irradiation is unknown at this point. That aside, my attention was drawn to minor details, as usual, in the trailers for the summer-blockbuster-in-the-making "Godzilla", which opened this weekend in the US grossing over $93 million, according to The Hollywood Reporter. "Janjira Nuclear Power Plant" in a town at the foot of Mt. Fuji. The town is supposed to be near Tokyo, even if it is this close to Mt. Fuji. A stereotypical nuclear power plant you see often in the US (but none in Japan) with vigorous steam rising from the cooling towers, like the one you see in "The Simpsons" or Three Mile Island NPP. The plant seems to sit right in the middle of town. Why a nuclear power plant needs so many smoke stacks of different heights is a mystery to me. But take a look at the house in the foreground. Very interesting roof line, with fin-like structures like in a Buddhist temple in Thailand. The sky is blue, with "The Simpsons"-like puffy clouds, but there are two people walking by with umbrellas. The concrete walkway looks wet. Godzilla's foe this time is a huge ancient creature who feeds on radiation, a "MUTO (or Massive Unidentified Terrestrial Organism)", according to the wiki entry of the movie. Nice, sarcastic touch, intended or not. Muto is the surname of the vice president of TEPCO when the Fukushima I Nuclear Power Plant accident started on March 11, 2011. Mr. Muto gave daily and nightly press briefings in a small room at TEPCO's headquarters in Tokyo in the first week of the accident. The impression I got from these trailers is that the movie is way too serious for the loose details. But who cares about details (except me)? My favorite Godzilla movie remains "Mothra vs Godzilla" (Godzilla was a bad guy). Wonderful loose details galore. A public referendum was carried out in the canton of Bern on May 18 to decide whether to shut down Mühleberg Nuclear Power Plant near the Swiss capital Bern. The measure was defeated, with 36.7% in favor and 63.7% against. Muehleberg Nuclear Power Plant is slated to be shut down in 2019, but residents proposed the measure after the Fukushima I Nuclear Power Plant accident. The turnout was 51.6%. Muehleberg NPP has been found to have multiple cracks in the core shroud. See my post in March 2012. 40% of Switzerland's electricity comes from nuclear power, and 60% comes from hydroelectricity.